With greater demands being made on the availability of clean water in countries where water is very much a precious commodity, greater resources are being invested in the types and designs of the water supply systems. One of the key issues in designing a water transportation system is hydraulics and this is where the experience and technical capabilities of pump manufacturer is all important. 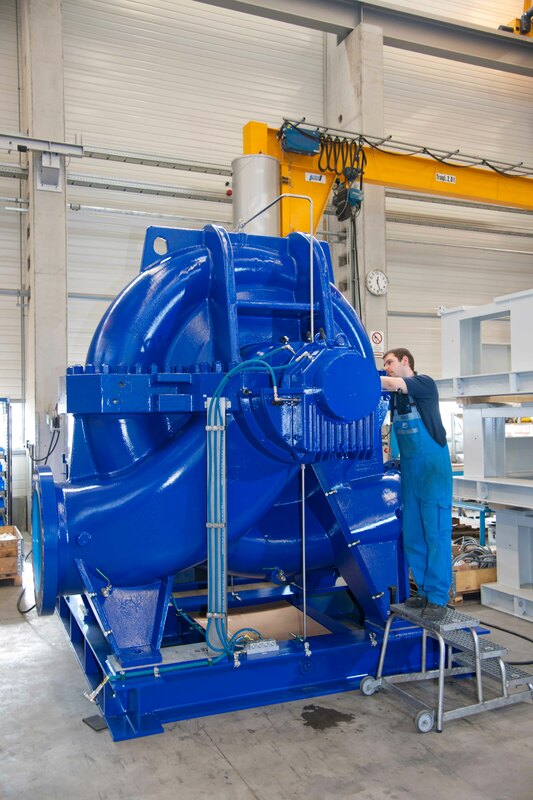 KSB AG with its considerable global experience in providing pumping equipment for water transportation systems has vast experience in this particular area and recognises that lower hydraulic pressure losses result in energy savings. With its Omega, RDLO and RDLP horizontal split case single and multi-stage pumps, KSB provides a large and varied range of system designs that cover the most diverse of requirements and customer specifications. Water supply on a broad basis is becoming one of the biggest challenges to mankind because of population growth in areas where it is hot, where the ground water sources are scarce or not clean due to pollution. In addition to this is a growing demand for water from agriculture, industrialisation and mining in remote areas. As a result, there is a fast growing requirement to transfer water over far longer distances, making it necessary in many cases to customise the water supply structure and this will involve project engineering to suit the recognised and defined needs of the project. It also has an impact on pump technology and KSB has responded by developing a pump capable of transferring water over longer distances, namely the RDLP (Fig. 1). For applications where the nominal diameter of the discharge (DN) ranges between 80 and 700, KSB has for many years been supplying its Omega and RDLO series pumps, which were developed for the water industry. The RDLP pump is something of an enigma within the KSB product offering as it is a fully engineered pump. It is a customised pump that grew out of the RDLO axial spilt case single stage pump series developed for water transportation. Pump sizes are developed fully project specific and are based on certain basic design principles. Based on dimensionless parameters, this tool generates the main dimensions of the hydraulic shape for given flow, head and rotational speed. From that the pump dimensions are derived including those of the raw material parts, such as casing, impeller, diffuser etc. Further it generates a dimensional drawing of the pump as will be necessary for layout planning by the contractor or customer (owner/operator). Such information can now be generated within less than a day, and this can be presented to procurement so that they can go out to enquire for purchasing. Proposing such a customised solution requires a lean process supported by appropriate tools that generate the appropriate information in a time frame to meet market expectations in a fast moving environment. Whilst it appears that it is possible to press a button (in this engineering tool for proposing customised solutions) and out comes the pump, this is not completely true. However, it does look very much like the real thing. The approximation of what the pump will look like once it is fully engineered after the order and contract have been received is very close, particularly in respect of dimensions and weight. Once an order for a proposed solution has been received the detailed design process starts in hydraulic engineering. As an input into hydraulic modelling serve basic design data, such as flow, head and NPSHa, new hydraulics are developed using a combination of methods and tools. CFD (computational fluid dynamics) modelling is the state of the art resource, complemented by the experience from existing and documented hydraulics that may be used for scaling up or down. Finally model testing on a technical scale is a useful step to verify performance for completely new hydraulics. The result of hydraulic modelling will be a shape that serves as the input into mechanical engineering design (Fig.2). This design stage generates a 3D model, which needs to be analysed via structural mechanics using FEM (finite element mechanics). Via a number of iterations in which reinforcements may be introduced, reallocated or deleted the 3D model is optimised to the best possible compromise of weight on one hand, but sub-critical tensions and stresses on the other. Generally, for all pump design types the choice of bearing is determined by the weight of the rotor. Radial (from rotation of the impeller) and axial (from thrust) forces must be considered too. However for double flooded hydraulics the axial component is usually considered negligible. Radial forces are normally rather low due to the double volute type hydraulic. Antifriction bearings are generally preferred, but they are limited whilst plain bearings can take higher loads (from the rotor weight) as are often present on such large scale pumps. Irrelevant of the bearing type, the double entry radial impeller principle is applied. For multistage pumps, that would require two suction nozzles to divide the flow evenly feeding two single flooded first stage impellers both of which feed the double flooded second stage impeller in the middle via a diffuser. Mating flanges are to DIN, ISO, BS or ANSI with materials complying to DIN in all required material combinations. The RDLP 600-1300/1 is the latest version of the RDLP and has been designed for water transportation duties in Setif East pipeline in Algeria. Here the requirement is for pumping stations to be equipped with pumps and providing flows up to 1.44m³/sec per pump. Four of the stations are equipped with RDLP600-1300/1 single stage pumps with diffusers and fitted with bearings. The customer specifically requested that these pumps be supplied as single-stage variants with a diffuser. The material used for the manufacture of all impellers was stainless steel as required by the strength properties. Other locations for which RDLP pumps have been designed include Boussiaba and Setif West in Algeria (both using same pump RDLP 600-1300/1), Hofuf in Saudi Arabia (RDLP 350-550/3), Dandalup (RDLP 350-700/2), Perth in Australia (RDLP 500-950/2), and Caracas in Venezuela (RDLP 400-690/2). Bryan Orchard is a UK-based independent journalist and media consultant specialising in fluid handling technologies and environmental engineering.